Leander’s sole purpose seems to be to lavish personal attention on her guests. Leander’s sole purpose seems to be to lavish personal attention on her guests: She has room for only 12, with ten cabins, including a master suite with Jacuzzi and private observation lounge. 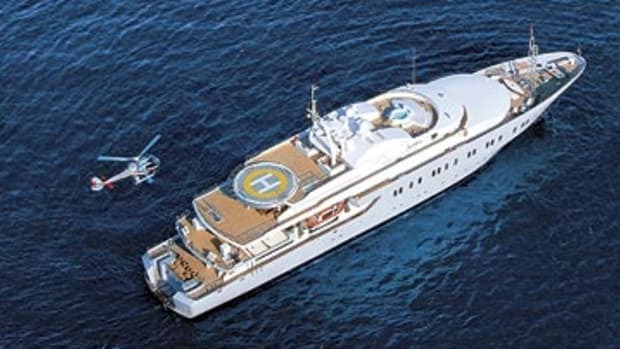 A crew of 26 (that’s a 2:1 crew-to-guest ratio) assures that this charter yacht is for the elite of the elite. This kind of extravagance comes at a price, of course (exclusive of expenses). But in exchange you’ll get a pair of 32-foot custom tenders, dinghy sailboats, windsurfers, three PWCs, and snorkeling and scuba equipment for all onboard. No wonder that she’s a popular choice for families, as kids and adults can enjoy most activities together.